This is an annual drive that we host to collect school supplies for Title 1 schools in need. In 2016, we partnered with RESTORED and RBOC. Together, we hosted the school supply drive, fund raisers and back to school community event. We gave out 214 school supply packages at the Back to School Community Bash and 60 packages to two teachers. In 2017, we partnered with with (FOF) Full on Faith & LSGF) Let's Start Giving Foundation. Together, we hosted the school supply drive, fund raisers and were vendors at several community events. We gave out over 500 school supply packages to classroom teachers, students, organizations, churches and homeless shelters. This year, we have partnered with D. Waites & Associates and Freedom Missionary Baptist Church. 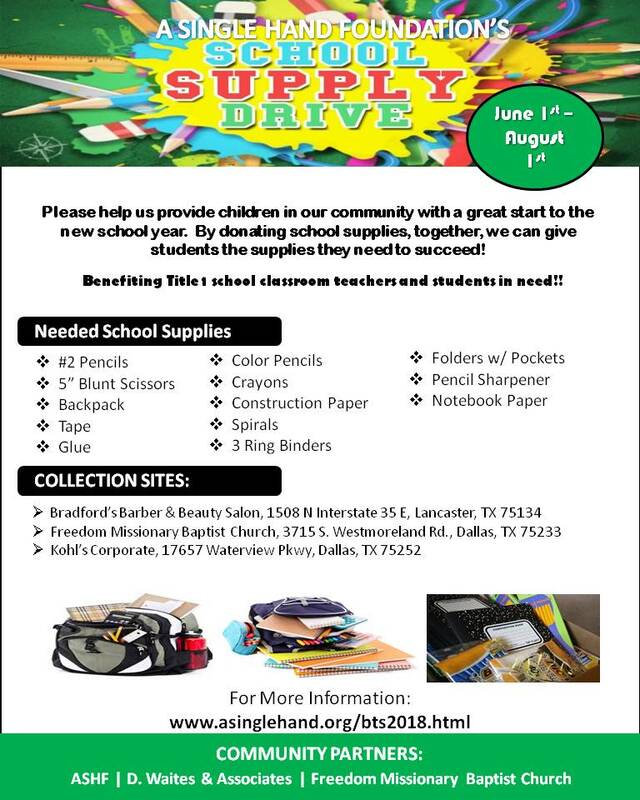 We are hosting a school supply drive and a community event to give to classroom teachers and students in need. We will help over 500 individuals in need. Please help us reach this goal. Together, we can will help more students and classroom teachers in our communities! ﻿We are in need of Collection Sites. If you would like to become a Collection Site, please sign up! All proceeds are used to purchase school supplies. Your donation is tax deductible.